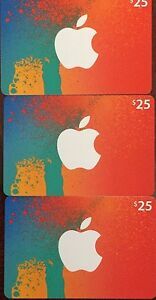 $25 Amazon Gift Card "Free Shipping, No Expiration & Brand New"
Details about Canadian iTunes Cards 3 X $25 $75 total. PLAY BRAWL STARS!!! Canadian iTunes Cards 3 X $25 $75 total. PLAY BRAWL STARS!! !